The first holy bath at the Kumbh. 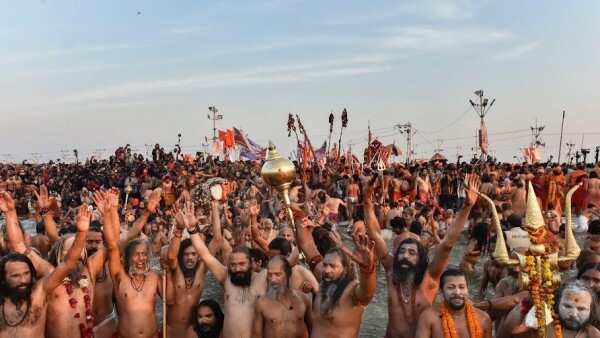 In one of the largest religious gatherings in the world, more than two crore pilgrims and holy men took a dip at the Sangam, the confluence of the Ganga and Yamuna rivers and the mythical Saraswati, as the Kumbh Mela opened on Tuesday, according to officials. But the figures were contested by many. “We are glad to announce that the first ‘Shahi Snan’ (royal bath) began and concluded at the scheduled time. The participation of all the 13 akharas remained orderly and was successful. Approximately two crore devotees took the holy bath,” Dilip Kumar Tripurayan, ADM Kumbh, told reporters. But some correspondents pointed out that several bathing areas were deserted and felt the official numbers may be exaggerated. Some journalists asked the administration to reveal how the numbers were calculated. “Yeh mota moti aankalan hai. (This is the approximate calculation,)” Tripurayan said. Soon after midnight Monday, throngs of devotees gathered here for the Kumbh from within the country and abroad began proceeding towards the bathing ghats. Loud religious chanting as well as melodious singing of ‘bhajans’ reverberated through the by-lanes of this Uttar Pradesh city for most of the night. Visitors reached the ghats that were lit up like Diwali in a hue of multiple colours, amid heightened security and waited for the ‘Shahi Snan’ to begin. The moment arrived before just dawn around 5 a.m. when, with prayers on their lips, many took the holy dip in the water as cold as ice. The 13 ‘Akharas’ participating in the ‘Shahi Snan’ on Tuesday included Maha Nirvani, Atal, Niranjani, Anand, Juna, Avahan, Panchagni, Nirvani Ani, Digambar Ani, Nirmohi Ani and Naya Udaseen, Bada Udaseen and Nirmala. Each of them had been allocated about 45 minutes by the Kumbh authorities. The ceremonial bath drew huge crowds while devotees continued to throng Prayagraj in large numbers. The ‘Shahi Snan’ is considered among the most significant components of the Kumbh. Elaborate security arrangements were in place and pontoon bridges had been built to lead the visitors to the 5-kilometre bathing ghat at Sangam. Prime Minister Narendra Modi posted a video on Twitter shortly after the ‘Shahi Snan’ began, marking the official start of the fair. The Kumbh Mela is held every six years while the Maha Kumbh takes place every 12 years. According to officials, about 15 crore devotees are expected to partake in the pilgrimage, which, according to legends, opens the doors to heaven. Over 40,000 LED lights have been used by the administration to light up the bathing ghats as well as illuminate the historic city.